Read the full article at Public Radio International. Dozens of patients wait to collect their HIV/AIDS medication at Mayuge Health Centre III in Uganda. The clinic is one of several in southern Uganda facing chronic shortages of both antiretroviral medications and Septrin, a complimentary drug that prevents infections in patients with weak immune systems. An officer with the Ministry of Health registers new patients for HIV treatment at Mayuge Health Centre III in Uganda. 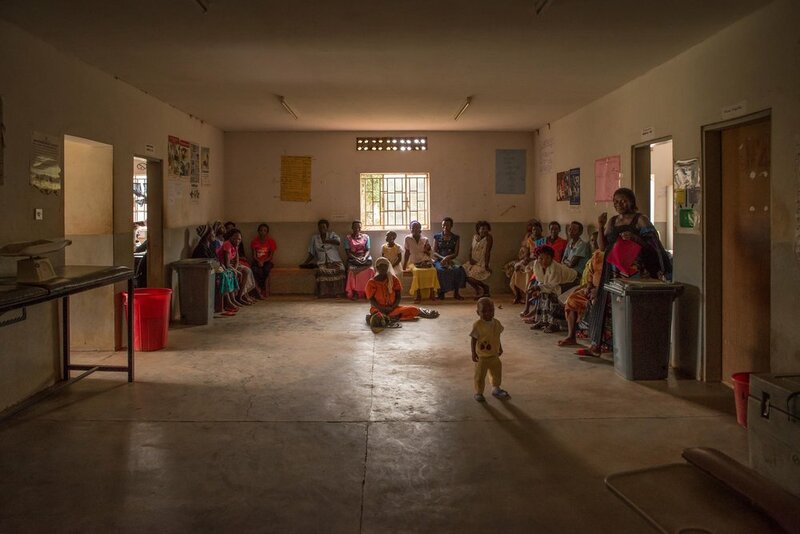 Women wait for their monthly prescription of HIV/AIDS medication at Mayuge Health Centre III in Uganda. Clinic staff distribute their remaining HIV/AIDS medication to patients at Mayuge Health Centre III in Uganda. Other types of antiretroviral and antibiotic medication remain out of stock. This clinic, along with others across Uganda, has experienced ongoing stockouts of HIV/AIDS drugs for more than a year. The Ugandan government insists the drug supply issues are limited and temporary. Community health worker Ignutious Lusalalira pages through a patient registration log at Mayuge Health Centre III in Uganda. Files containing new patient information, HIV testing outcomes and patients who have been lost to follow up are stacked behind him. In January, there were one or two weeks when there were no drugs at all. If [the government] doesn’t fix this, people’s immunity will get worse. Shelves designated for ART storage remain empty despite multiple requests for emergency orders of Septrin and second line drugs. There were “less than two months of stock” for most HIV/AIDS drugs according to a June 2017 Ministry of Health stock status document. Still, reports of ART shortages continued across western, northern and southern Uganda through May 2018. Rukia Webombesa waits for a hospice nurse to distribute a dose of liquid morphine in their home in south central Uganda. She is dying of AIDS. Rural areas of Uganda have faced chronic stock outs of HIV/AIDS drugs for more than a year. Many blame the country’s new “test and treat” program, which aims to treat all HIV positive Ugandans regardless of the severity of their disease, for the shortfalls. They claim too much demand and not enough supply, coupled with poor donor management and chronic underfunding has left thousands of patients without their lifesaving drugs since June 2017. Beatrice Namnganza, 50, is examined by a hospice nurse in southern Uganda. Namnganza tried to pick up her monthly prescription of antiretroviral but the clinic was out of stock. That was 13 days ago. She is dying of AIDS. 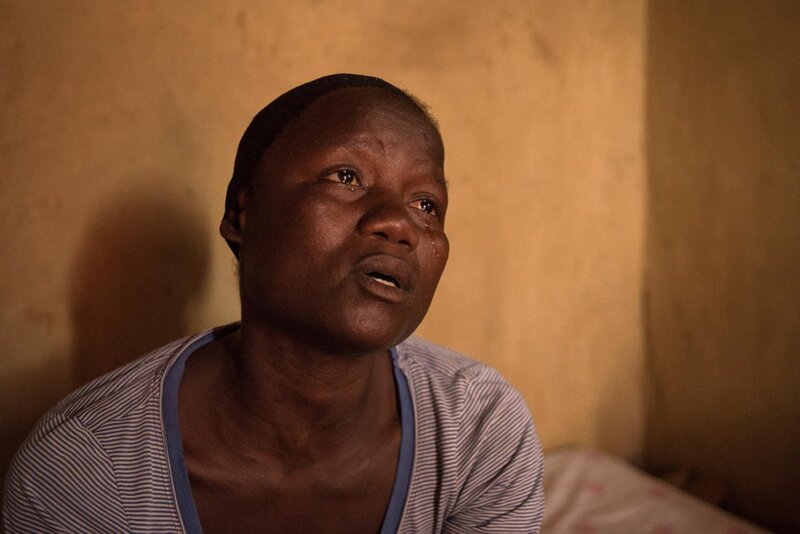 Maureen, 28, was diagnosed with HIV/AIDS during a routine medical appointment in 2013. Forced into a polygamous marriage with a man who never disclosed his status, both Maureen and her two co-wives discovered they were HIV positive. Maureen asked to sing a song about HIV/AIDS during our interview in October 2017. She said she learned the song when she was in primary school, long before she contracted the HIV/AIDS virus. Maureen now lives alone in a small concrete room on the outskirts of Jinja, Uganda. She is receiving pain and end-of-life care from a local nonprofit. Community health worker Annette Babinye Ayazika speaks with patients at Wabulungu Health Clinic in southern Uganda. “At times, they have (the drugs) but they also run out of stock,” said Ayazika. And even when the drugs are available “the patients are too many,” she said. A woman waits to be seen by a doctor at Wabulungu Health Clinic III in Uganda. Patients wait for a doctor at Wabulungu Health Clinic in southern Uganda. For the last five months, this clinic, along with a others in the area, have experienced shortages or complete stock-outs of HIV medication; some lasting as long as one or two months. Still, reports of ART stock-outs continued through May 2018 and “are still ongoing as we speak,” said Henry Zakumumpa, a health systems researcher at Makerere University.